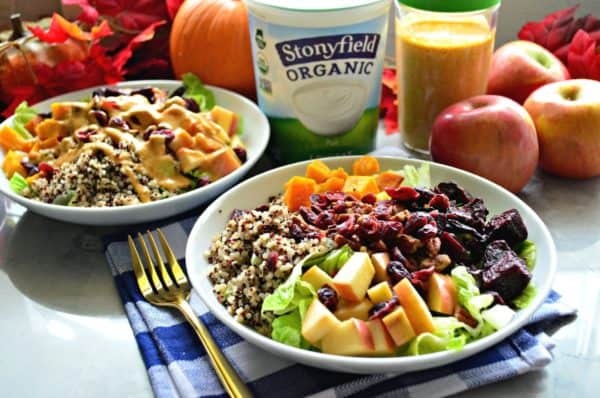 Thank you Stonyfield Organics for sponsoring today’s recipe. As always, all opinions are my own. Celebrate the flavors of fall and make my delicious and healthy recipe for Harvest Quinoa Salad with Pumpkin Yogurt Dressing! Get ready to treat your taste-buds to flavors of fall! I love nothing more then a hearty salad with homemade dressing, and I’ve done it yet again–created a salad recipe that I’m quite addicted to. As I was creating this recipe I was testing with neighbors and every neighbor also became addicted to this salad recipe. It’s been my go-to lunch for the past few weeks and I don’t think I’ll stop eating this salad until after pumpkin season has ended. This recipe comes together quickly with a little prep work. I like to roast a big batch of fresh butternut squash and red beets. Although if you can find golden beets you can roast those too. I also like to make a large batch of quinoa in my Instant Pot and then freeze into small portions to thaw out and use for quick lunches. So with a little prep work (preferably on the weekend) the salad is half done. 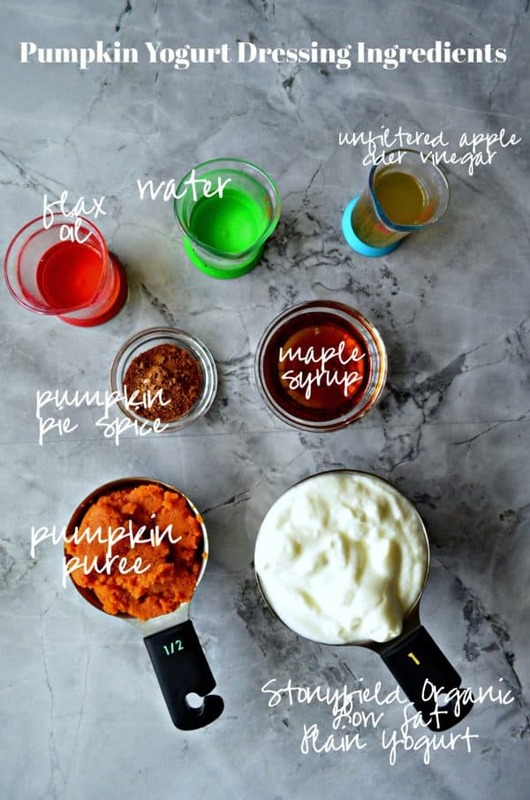 To make the delicious pumpkin yogurt dressing you don’t need any fancy kitchen gadgets just a whisk and bowl! Of course you can blend all the ingredients in a food processor or blender, but I don’t find that it’s needed. 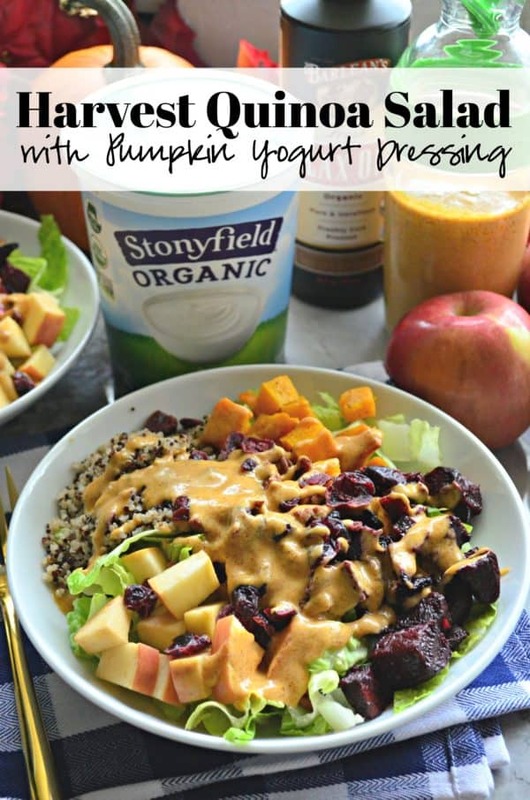 The star to the dressing is the Stonyfield Organic Low Fat Plain Yogurt. I always have a quart in my refrigerator ready to transform into a delicious dressing. 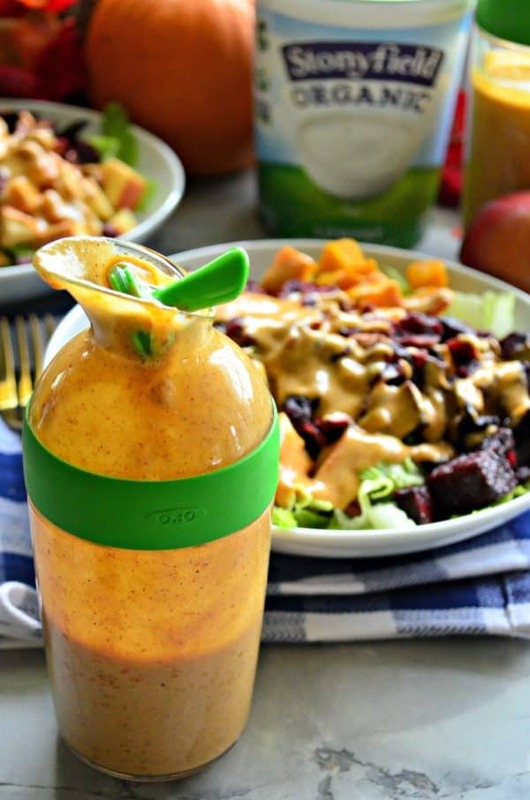 I experimented with this dressing recipe and found that two teaspoons of pumpkin pie spice was the perfect amount. It might sound like a lot but your making about 4 cups of dressing. I like using maple syrup as a natural sweetener verse brown sugar but either will work. I also use some water in the pumpkin yogurt dressing. If you read the label to any store bought salad dressing the first ingredient is water! So, an easy tip–if your making a dressing at home and your not happy with the consistancy and want the dressing thinner–just add water. If you want the dressing thicker add less water. Easy as that. Also know, that the dressing will last a week in the refrigerator (just check the expatriation date on your yogurt and label your dressing). Note: just because this recipe is for 4 salads you will definitely have leftover dressing for more. I like to store in a mason jar or salad shaker like this one from OXO. I like that it has an easy pour spout and you can seal it closed. After I make my dressing I like to keep it chilled for at least 30 minutes before serving. Just know that when making homemade salad dressing it’s normal if it separates. Just give it a shake or stir before your ready to pour. If your a fan of salad in a jar you would want to layer in the following order: pumpkin yogurt dressing, apples, butternut squash, beets, cranberries, almonds and lastly the romaine. Whether you are looking for a new salad recipe or simply want to break out and try something festive for the season I invite you to give my recipe for Harvest Quinoa Salad with Pumpkin Yogurt Dressing a try! 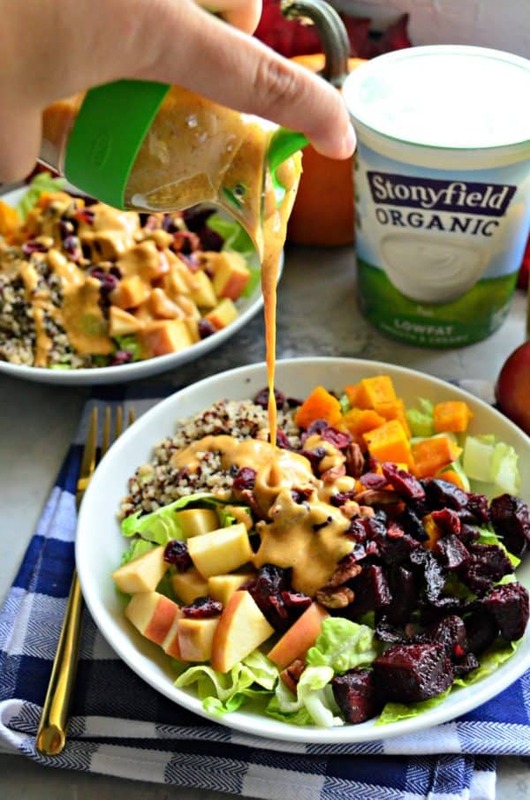 In a large bowl, pour the Stonyfield Organic Low Fat Plain Yogurt in the bowl. Then add in the pumpkin puree, pumpkin pie spice, maple syrup, and unfiltered apple cider vinegar. Whisk together then begin to slowly whisk in the flax oil and water. Whisk until well mixed for about 30 seconds. Pour into a dressing container or mason jar and refrigerate for up to 1 week (or expiration date on yogurt container). Divide chopped romaine lettuce between four large pasta-size bowls. Then divide the cooked quinoa, roasted butternut squash, and roasted beets evenly among the salad bowls. Dice an apple and divide evenly among bowls. Sprinkle on the pecans and dried cranberries, and repeat until each bowl has the toppings. Then pour the Pumpkin Yogurt Dressing on top. Enjoy immediately. Note: To speed up prep time, I roast the butternut squash and beets ahead of time and then store in the refrigerator to make this salad on the fly. I also make a large batch of quinoa ahead of time. Disclosure: There are affiliate links in this post. This means, if you click on the links and purchase I will receive a small percentage of the sale at no additional cost to you. This sounds just delicious! So perfect for the season! Yes! Perfect for holiday entertaining! This is such a pretty salad, perfect for a fall dinner or holiday table. Kristi–you got it! It’s my go to Fall entertaining salad (and lunch most days)! What a fun twist on the dressing! It’s so good its drinkable! Thanks! It’s so good I could drink it on its own!